The bavarian commander FZM Minuzzi had the order to retreat to Marktl if superior forces would attack him. Although spys told him, that the austrians were on the banks of the river Inn (he heard that there were 14 bn.s of them!) and very near, he decided to wait. 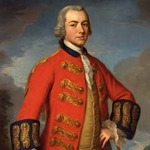 Perhaps he thought that his position was to strong to attack and prince Charles would withdraw. One part of his forces was in Braunau under the command of Sachsen-Hildburghausen. But most of the bn.s were at Simbach (9-10 bn.s, 10 coys of Grenadiers, later 25 sq. of cavalry and some hussars) with a outpost in Erlach. This village was attacked by the austrian vanguard under Berlichingen in the morning. First Minuzzi wanted to save the place. He sent more Grenadiers and later the IR Minuzzi and the DR Hohenzollern. When it was clear that the garrison of Erlach had no chance, Minuzzi commanded the dragoons and his regiment back to their positions behind the Simbach. It seams that Minuzzi was a real fool. Later he wanted to excuse his Actions: he said that he did'nt know how many austrians would attack him. It was a lie. He knew everything and because he expected the assault - he sent for reinforcements from Marktl and Ötting (including hessian dragoons). 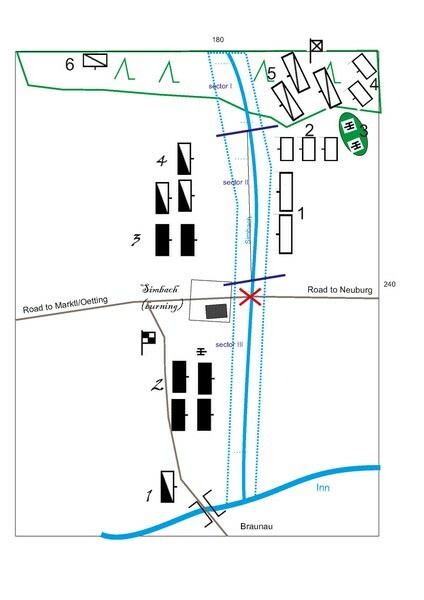 The scenario recreate the main events with the outflanking maneuver of FML Berlichingen. The Simbach was very difficult to cross with marchy ground. I thought that Berlichingen found a better section to cross the stream. All Actions of fighting were in the North where even austrian infantry managed to cross the stream which caused the rout of the bavarian left wing (attacked in front and flank!). The game would be to difficult if I would include the whole army under prince Charles. Cannot move until turn 3! The village Simbach is burning. No unit can march through the village. Bavarians win, if the Austrians cannot break them in 10 turns! * Don't know if he was in Charge. But he commanded infantry in this time. ** Units may march to the stream and players may roll than or roll before the units start the movement. Roll for every unit, not for the whole brigade. ** There were some footbridges. But nothing to cross the stream with bn.s in line. Perhaps interesting for everybody, who wants to have the right Units in his refight. 2 bn.s Holnstein 1 gren.coy. 1 bn Holnstein 1 gren.coy. It's strange that in the austrian book by the Austrian-Hungarian Kriegsarchiv is a lot more clear about the bavarian units at Braunau than about the austrians. The prince Carl did his enemy the honour to mention, that the bavarians fought very bravely for 5 hours. They lost many of their soldiers because Nadasdy pursued them to Marktl and many of those, who fled to Braunau found the doors closed because the garrision feared that the enemy would enter the town. Thanks for the information Damnitz. The idea of a mid-C18th Bavarian army is very appealing. Two weeks ago I purchased an painted army of bavarians. Unfortunately the army was damaged by post and I'm now repainting and glueing the figures. I hate to repair any figures. But now I have a lot of cavalry and some infantry available, although the uniforms fit better for the War of the Spanish Succession. The style of painting is very different to my own. The painter use no shading at all and the figures are looking more like toys. The bad thing is, that the Colors are not fixed so well ... Nevertheless I hope to repair my last figures in the next weeks and will be able to refight the battle as soon as possible. That's a pity; would a wash and varnish sort the problem? I know the feeling, although I've always been lucky in that people have passed on painted figures to me rather than me having to pay. My last unit of Prussian dragoons were a case in point - not my style, but a quick retouch and wash made them more acceptable. Will post a couple of pictures once I get a new USB for my newly arrived camera. I fear that a wash would remove the paint. But I will make photos when I'm ready and hope you will enjoy them. By the way, I got 12 figures of 10mm 17th-century horse, which look a lot better. Perhaps I will start with 10mm in some years, if I can make out the manufacturer. If they are well sculpted figures of the League of Augsburg period then they are most likely Pendraken. Their League of Augsburg range in 10mm is exquisite, and I believe some of the figures are being remodelled with tricorns to allow for a WSS option as well. Yesterday I finished my boring paintjob. I hope to refight the battle next week. Now I have 2 regiments of horse, 2 regiments of elite cavalry (horsegrenadiers, carabiniers), 3 regiments of dragoons, 5 bn.s of infantry, 5 batteries of artillery, 3 staffs and 1 CinC. More cavalry indeed than I will ever need for a battle, where the bavarians are present. By the way: it's somehow tempting to refight the battle with a ratio of 1:1 units. On the bavarian side I would need 4 more bn.s of infantry only. Thanks for keeping these fascinating scenarios coming Damnitz. They are getting to be quite a resource. I think that the scenario is well balanced. Last week I had the chance to visit Simbach. The village was burned in 1743 and therefore it's no surprise, that I could'nt find contemporary buildings. Simbach was changed after Braunau came to Austria. That means that Simbach today is a small town covering most of the original battlefield. The Simbach-stream is looking now completely different, crossing the town of Simbach. I can recommend to visit Braunau (place of the large siege in 1743 and battle in 1809) and the fortress Oberhaus in Passau (50 km from Simbach). I hope to write a repport about the action at Simbach and the battlefield today on our blog. The map shows that the distance from Simbach to Braunau was very large. Today the "old" center of the city of Simbach is near the river Inn!